Unifyed Student – Financial Aid powered by PowerFAIDS® is a highly efficient and comprehensive solution that helps higher ed institutions in managing and automating financial aid; drastically eliminating manual processes. Now managing multiple programs of any scope and complexity will become super easy, whether traditional or non-traditional, large or small, etc. Unifyed Student – Financial Aid will help institutions in reducing the administrative burden of federal compliance, manage student eligibility, verification, loan origination, and aids in real-time reporting. Reduce administrative burden of federal compliance by automatically maintaining regulatory updates like ISIR files, Pell Grant tables, Common Origination and Disbursement (COD) files, etc. Track financial aid applications, automatically generate the letter of intent to communicate with students and parents. Powered by PowerFAIDS, the platform supports multiple reporting and surveys efforts FISAP, IPEDS, and Common Data Set without IT intervention. 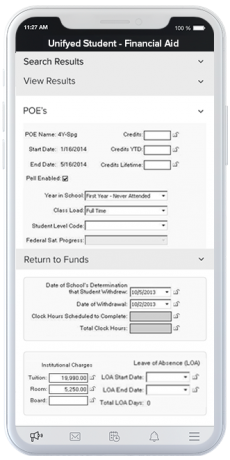 Automating and tracking multiple financial aid programs is now easier. Manage all kinds of programs, including federal, state, institutional, etc. Help your students with a flexible and self-serviceable tool to view the status of their financial aid application. Provide necessary alerts and info on scheduled and actual disbursal of funds. Eliminate manual processes, automate all the tasks, and save crucial man-hours to focus on student success. Want to explore more about the capabilities of Unifyed Financial Aid?